The above data shows the subscriber numbers for the combined 21 subsidiaries of the Company, including those of the 8 subsidiaries acquired on 1 July 2002. 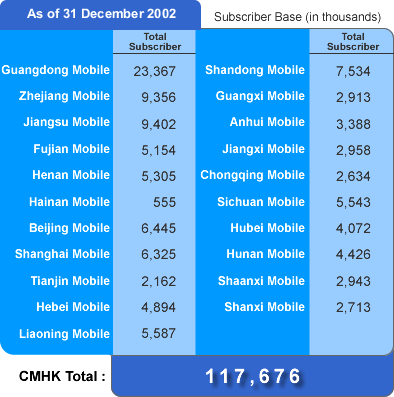 As of 31 December 2002, the combined 8 new subsidiaries had a total of 28.677 million subscribers, which included 13.721 million contract subscribers and 14.956 million prepaid subscribers. For the month of December, net addition of subscribers for the combined 8 new subsidiaries was 0.691 million, comprising 0.066 million contract subscribers and 0.625 million prepaid subscribers. The above data shows the subscriber numbers for the combined 21 subsidiaries of the Company, including those of the 8 subsidiaries acquired on 1 July 2002. As of 30 November 2002, the combined 8 new subsidiaries had a total of 27.986 million subscribers, which included 13.655 million contract subscribers and 14.331 million prepaid subscribers. For the month of November, net addition of subscribers for the combined 8 new subsidiaries was 0.633 million, comprising 0.059 million contract subscribers and 0.574 million prepaid subscribers. The above data shows the subscriber numbers for the combined 21 subsidiaries of the Company, including those of the 8 subsidiaries acquired on 1 July 2002. As of 31 October 2002, the combined 8 new subsidiaries had a total of 27.353 million subscribers, which included 13.596 million contract subscribers and 13.757 million prepaid subscribers. For the month of October, net addition of subscribers for the combined 8 new subsidiaries was 0.62 million, comprising 0.055 million contract subscribers and 0.565 million prepaid subscribers. The above data shows the subscriber numbers for the combined 21 subsidiaries of the Company, including those of the 8 subsidiaries acquired on 1 July 2002. As of 30 September 2002, the combined 8 new subsidiaries had a total of 26.733 million subscribers, which included 13.541 million contract subscribers and 13.192 million prepaid subscribers. For the month of September, net addition of subscribers for the combined 8 new subsidiaries was 0.545 million, comprising 0.053 million contract subscribers and 0.492 million prepaid subscribers. The above data shows the subscriber numbers for the combined 21 subsidiaries of the Company, including those of the 8 subsidiaries acquired on 1 July 2002. As of 31 August 2002, the combined 8 new subsidiaries had a total of 26.188 million subscribers, which included 13.488 million contract subscribers and 12.700 million prepaid subscribers. For the month of August, net addition of subscribers for the combined 8 new subsidiaries was 0.524 million, comprising 0.062 million contract subscribers and 0.462 million prepaid subscribers. The above data shows the subscriber numbers for the combined 21 subsidiaries of the Company, including those of the 8 subsidiaries acquired on 1 July 2002. As of 31 July 2002, the combined 8 new subsidiaries had a total 25.664 million subscribers, which included 13.426 million contract subscribers and 12.238 million prepaid subscribers. As a result of the change in monthly billing period, the reporting month of June 2002 has been adjusted to cover the period from 21 May 2002 to 30 June 2002.